A Vespers of the Cistercian Order in the 13th century with works by Monastery Maulbronn, Cistercian nuns of the monastery Las Huelgas and Cistercian Antiphonary from Morimondo, performed by the Ensemble Vox Nostra. Jephta was Handel's last work of great dimensions. It was written in 1751 in London. It was performed for the first time at Covent Garden at february, 26. in 1752. Händel's last dramatical work was in the same time the most poetic of his oratories. The tension is not created by action but by the inner aspect of Jephta's unsolvible solitude. Expelled from Gilead by his half-brothers, he grows up in exile and becomes a godfearing army commander, while Gilead is suppressed by the Ammonites. After 18 years of slavery, the eldest of Gilead ask Jephta to free them from their tyrants. As army commander, Jephta swears his god Jehova to sacrifice to him the first creature he will meet after victory. He can't see that it's his own daughter Iphis to take this burdon upon her shoulders. The desperation of Jephta, mother Storge and lover Hamor is met by the courage of Iphis, who comes to show herself as a true heroine. The tragical conflict of the sacrifice of his own daughter is turned to a good end, inspite of the outlines of the old testament. The music is of an overwhelming forcefulness and beauty. Jephta's importance is based in the first place on the imposing choir scenes. The choir has double function: at one hand he takes part in action actively, on the other hand he stays in the backround and comments on the story. The story: Jephtha is the illegitimate son of the Israelite leader, Gilead. On Gilead's death (over eighteen years before the action begins) Jephtha was scorned and thrown out of Israel by his half-brothers. He has been living in Tob with his wife, Storgè, and their daughter, Iphis, who was born in exile. Soon after Jephtha's exile the Ammonites attacked Israel and began a long and bitter war. This live recording of "Jephtha" is part of a cycle of oratorios and masses, performed in the basilica of Maulbronn Abbey under the direction of Jürgen Budday. The series combines authentically performed oratorios and masses with the optimal acoustics and atmosphere of this unique monastic church. This ideal location demands the transparency of playing and the interpretive unveiling of the rhetoric intimations of the composition, which is especially aided by the historically informed performance. The music is exclusively performed on reconstructed historical instruments, tuned in the pitch, which was customary during the composer's lifetime (this performance is tuned in a' = 415 Hz). An a-cappella-recording with works about love and sorrow for 4- to 12-part mixed Choir by Robert L. de Pearsall (1795-1856), Robert Schumann (1810-1856), Peter Cornelius (1824-1874), Sven David Sandström (*1942), John Tavener (*1944), John Rutter (*1945), Branko Stark (*1954), David Hill (*1957), Wolfram Buchenberg (*1962), Jaakko Mäntyjärvi (*1963) & Eric Whitacre (*1970). The Maulbronn Chamber Choir (German: Maulbronner Kammerchor) was founded in 1983 and counts today as one of the renowned chamber choirs in Europe. Awards like first places at the Baden-Württemberg Choir Competitions in 1989 and 1997, second place at the German Choir Competition in 1990, first prize at the German Choir Competition in 1998, second place at the International Chamber Choir Competition in Marktoberdorf 2009 and first place at the Malta Choir Competition show the extraordinary musical calibre of this ensemble. The Chamber Choir has managed to make quite a name for itself on the international scene, too. It was received enthusiastically by audiences and reviewers alike during its debut tour through the USA in 1983, with concerts in New York, Indianapolis and elsewhere. Its concert tours in many European countries, in Israel and Argentina as well as in South Africa and Namibia have also met with a similar response. 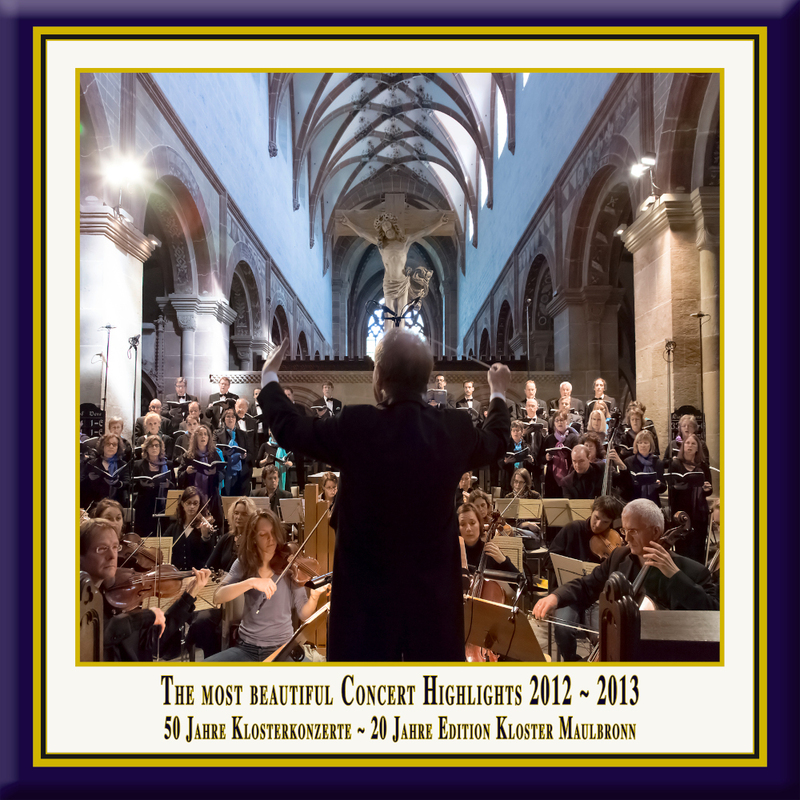 The choir has performed oratorios by George Frideric Handel each year annually since 1997. All these performances were documented on disc; because of that the Maulbronn Chamber Choir holds a leading position internationally as an interpreter of this genre. Since June 2016 Benjamin Hartmann is conductor and artistic director of the choir. This live recording of "About the Kingdom of God" is also part of the cycle of oratorios, masses and other grand works, performed in the basilica of Maulbronn Abbey under the direction of Jürgen Budday. The series combines authentically performed oratorios and masses with the optimal acoustics and atmosphere of this unique monastic church. This ideal location demands the transparency of playing and the interpretive unveiling of the rhetoric intimations of the composition, which is especially aided by the historically informed performance. The music is exclusively performed on reconstructed historical instruments, which are tuned to the pitch customary in the composer's lifetimes (this performance is tuned in a' = 415 Hz). on September 29 & 30, 2012.